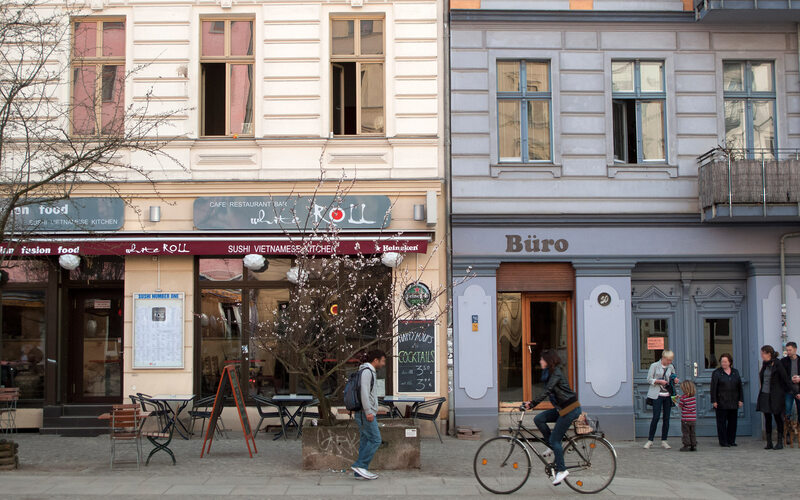 Kreuzberg, Berlin's traditional Turkish quarter, is emerging as one of the city's most dynamic cultural hubs. Since the beginning of the torturous Syrian civil war, many of the country's most creative young people have decamped for Berlin, where they have joined the city's thriving international arts scene, transforming their adopted community and themselves. 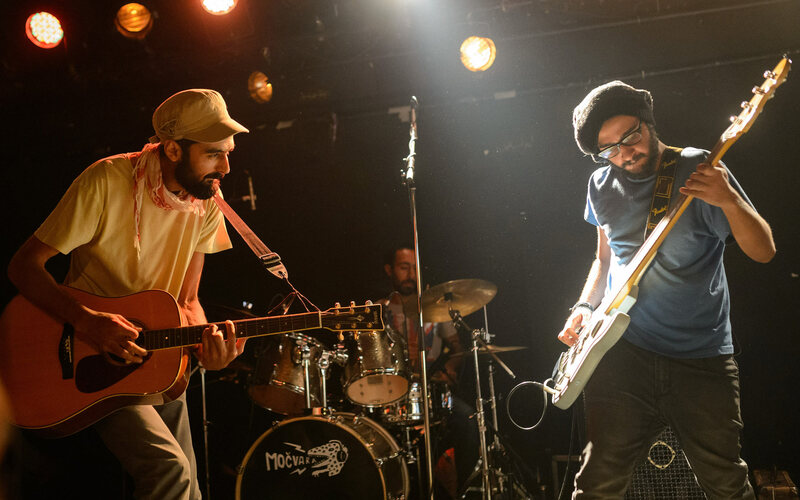 On a Friday night at the Werkstatt Der Kulturen, a basement venue in Berlin’s hip Neukölln neighborhood, a band called Berlin-Baghdad Bahn had everyone in the audience clapping in unison. Its Syrian singer, Wasim Ghrioui, stood bathed in blue spotlights, his soulful voice quivering in time with the accordion, oud, and contrabass. The group, which also included a German-born Kurd, an Italian, a Georgian, and another Syrian, was performing the Lebanese classic “Ah Ya Zein.” The song took the crowd on a musical journey from Europe to the Middle East, just as the Berlin-Baghdad Railway—the quixotic, early-20th-century undertaking for which the band is named—had once tried to do. During the encore, a few young Arab men in the corner let out ululations, alternating their outstretched arms and jutting their hips in time to the beat, as if home in Damascus. On the other side of the room, a blonde in a Day-Glo-pink muumuu danced in the corner, jerking from side to side with the kinds of moves you’d expect at the techno clubs Berlin is famous for. In the middle, a few German girls stood up and tried their own impromptu Arab-style dancing, awkwardly shaking their hips, raising their arms, and laughing at each other. A performance by the Berlin-based Syrian rock band Khebez Dawle. Today, in Berlin, the European and Middle Eastern cultural scenes are colliding, and I had come for a front-row seat. For well over a decade, artists from around the world have sought out the German capital as a cheaper alternative to New York, London, and Paris, recasting the city as Europe’s new cultural hub. While the Syrian artists and intellectuals who have arrived more recently came not by choice but to escape the six-year civil war that has ravaged their country, they have joined a booming creative community. Now these refugees are changing the city’s culture as much as they are being changed by it. “Before, it was me observing Berlin,” Ghrioui said. “Now, it’s me observing the changes that Syrians are making in Berlin.” The 35-year-old was part of the first wave of refugees flown in from Lebanon in 2013 on a government relocation scheme, as part of an “intellectual quota.” When he arrived three years ago, he told me he found that there were only 13 Syrian refugees registered in the city. During the first half of 2016, 22,471 Syrians applied for asylum, according to the German Federal Office for Migration and Refugees. In Damascus, Ghrioui crafted mosaics and painted. Since leaving Syria, he has branched out, in part because he hasn’t had the resources or space to pursue those original passions. He has staged an autobiographical play three times in Berlin and once in Hamburg, and plans next to adapt it into a graphic novel. He is also working on a second play, a video project, a documentary, and an art exhibition. 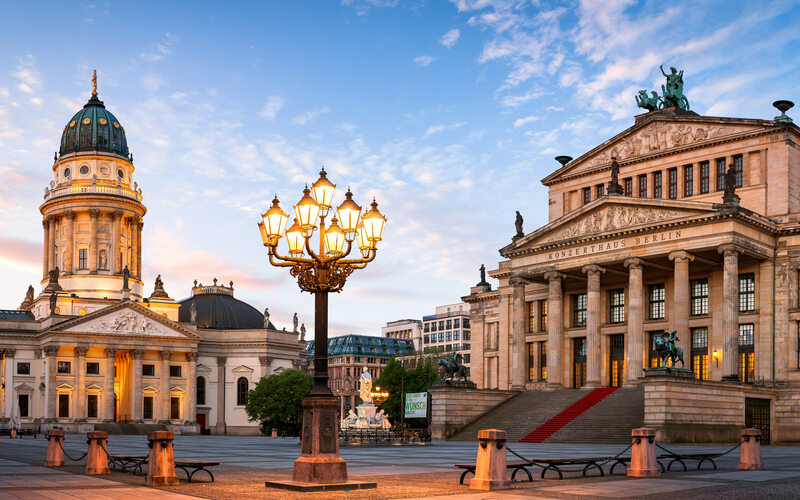 Centuries ago, Berlin's Gendarmenmarkt, a square ringed by German and French churches, served as a refuge for French Calvinists. Dische-Becker, a Berlin native who has also lived in the U.S. and Beirut, has noticed changes to her city since last summer’s massive influx of refugees: new Syrian restaurants, more Arabic spoken on the streets. “Berlin obviously recognizes the cultural capital that Syrians bring,” she said. Still, she admitted to being frustrated when she hears Khebez Dawle’s members pigeonholed as “refugees,” instead of “Syrian musicians.” “It’s like, ‘You’re just a refugee, you’re a person in exile,’” she said. 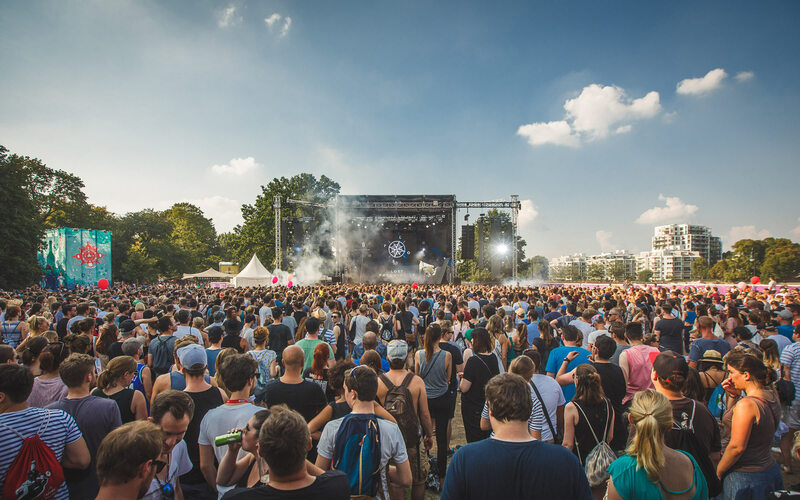 Lolapalooza at Berlin's Tempelhof, an airport turned city park. Some Syrians are striving to find commonalities by showing Germans the richness of their country—explaining where they’re coming from, and what they have left behind. Once a month, Bassam Dawood, a Syrian actor, and Rachel Clarke, a Scottish performer, host a handful of Syrian volunteers with stories to tell at different theaters around Berlin. The novice thespians perform a spoken-word show called Storytelling Arena in which they tell tales of everyday life in Syria before the war, of love and loss, of arriving in Germany, and sometimes of the conflict itself. They deliver their stories, sentence by sentence, in Arabic with translation so that audience members can feel the power of the original language. A Syrian band plays between the performers. “Germans are just getting the images of refugees from the media—that Syria is just death, destruction, and war, people fleeing. But we have very humane stories. We have a humane history and now such stories are happening too,” Dawood told me. “I wanted German people to really know what happened to the Syrian people.” The shows have been sold out ever since they launched in early 2016. Prenzlauer Berg, one of Berlin's more upscale neighborhoods, is home to Al Hamra café, frequented by many of the city's Syrian refugees. I met Dawood at the Al Hamra café, in the upscale neighborhood of Prenzlauer Berg. The café’s dark, red interior is more punk Berlin than traditional Damascus, but there are faint echoes of the smoky cafés across the Middle East that serve bitter, strong coffee and shisha. Despite the relatively poor quality of the hummus, Al Hamra has turned into a meeting point for Syrian artists. Most people I spoke to wanted to meet there. Even with the success of Storytelling Arena, the transition has been hard on Dawood. With his massive frame and large jowls, the buoyant actor looks like he was made for the stage. But to work in German film and television you have to speak German, a language that’s challenging to learn and even harder to make your own as an actor. “Starting here isn’t even starting at zero, it’s starting below zero. It’s very difficult,” Dawood explained. Last month, nearly three years after his arrival in Berlin, he began rehearsals for his first play, which will be performed in German, English, Arabic, and Hebrew. “It’s a crazy idea, but I love it,” he told me gleefully. Dawood’s friend, Athil Hamdan, a classical cellist and the former director of the Higher Institute of Music in Damascus, joined us. Hamdan lived in Dawood’s apartment for two months when he came to Berlin in August 2015. In fact, Dawood told me, since the beginning of 2015 the spare room in his two-bedroom flat has been continuously occupied by one Syrian artist friend or another. Berlin feels better to him now, he added, than when he arrived. There is a bigger Syrian artistic community, and with that comes more opportunity for collaboration and more old faces of comfort in a new place. The two old friends have spoken at length about the problem of charlatan art. “We’ve noticed that NGOs don’t really look at quality, they have a checklist of doing a project—one, two, three. They just want any Syrian to have an exhibition, to have a play, a concert,” Dawood explained. “This puts pressure on us, because after two or three years of working in this low quality, Germans have the impression that our Syrian art is low quality.” They are trying to change that. Two years ago, one of Hamdan’s former students gathered about 30 Syrian musicians from across Europe. Calling themselves the Syrian Expat Philharmonic Orchestra, they perform both classical works and their region’s traditional compositions. Because they are scattered across Europe, rehearsing together is difficult. “We are dreaming about how to make it a solid thing,” Hamdan said. Berlin’s open atmosphere has prompted some Syrians with no arts background, only a desire to explain their homeland, to become performers. On a Saturday morning, I joined a weekly English-language walking tour called “Why Are We Here?” hosted by a Syrian guide who uses German historical landmarks to tell stories about similar moments in his or her own country’s past. Mohamad, the leader, asked that I not use his last name because he still has family in Syria. A math student before the war, Mohamad reached Germany in 2014 after crossing the Mediterranean by ship from Libya to Italy. In an effort to make friends in Berlin, he attended a weekly open cooking night called Give Something Back to Berlin. There he met Lorna Cannon, a British tour guide active in migration issues who was working as a project manager at Refugee Voices, an NGO that was running a weekly walking tour led by African asylum-seekers. 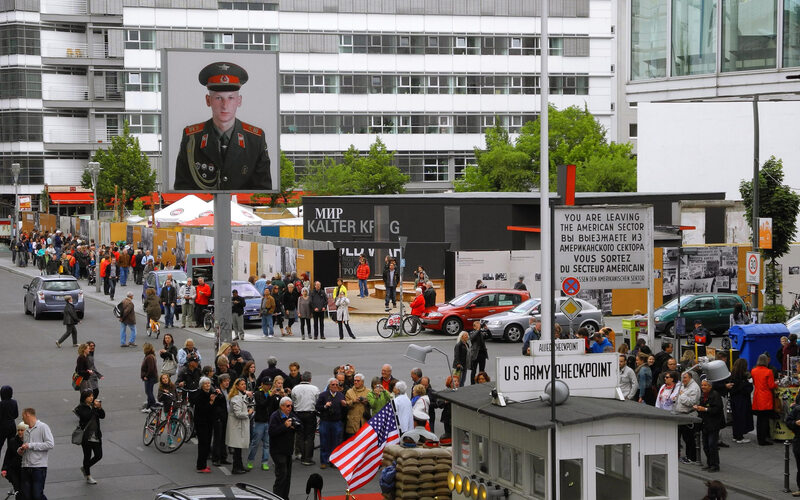 Checkpoint Charlie, the most famous crossing point between East and West Berlin during the Cold War. Cannon had been pondering the new wave of refugees coming into the city. “I thought, ‘Okay, there’s a massive migration, and we need to find a way to tell this other story and why people are here, because too often it’s the media telling a story,’” she said. Mohamad, now 26, had no prior experience in theater or public speaking, but was interested. After discussing the tour concept, they decided on the name “Why Are We Here?” It felt right: few of the locals they met seemed to know anything about the context of the Syrian war. We met at 11:30 a.m. at the Mohrenstrasse U-Bahn station. The group was a motley crew of American study-abroad students, older Germans, and solo tourists. We looked at Mohamad expectantly as we stood at the first point, a memorial to the uprising of June 17, 1953, when roughly a million East Germans gathered to protest the political and economic oppression of the German Democratic Republic before being brutally put down by the military. As we stood before the placard, Mohamad described the Syrian equivalent, which took place in the city of Hama in February 1982, when political protests against the government of Hafez Al Assad—the father of Bashar al-Assad, Syria’s embattled current president—were suppressed. The other members of my group all shook their heads. 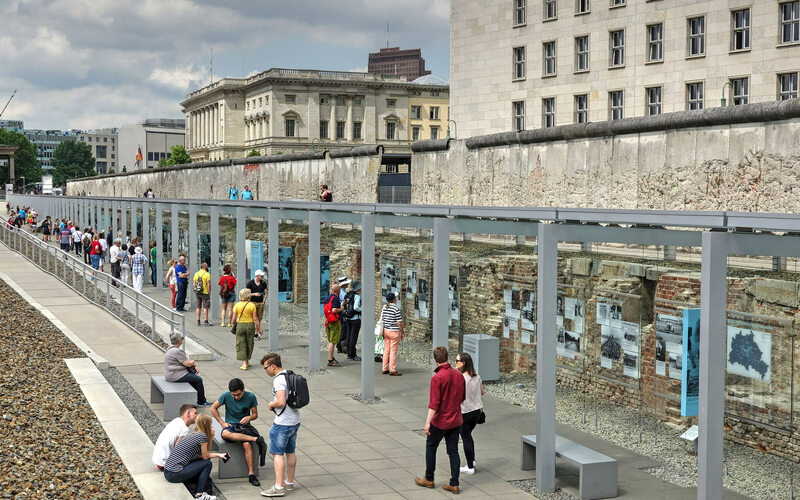 We walked to the Topography of Terror, a documentation center at the site of the Nazi Secret State Police headquarters, which were bombed during World War II. There, Mohamad described Syria’s own vast network of security services and secret prisons, which led to a discussion of the succession of Bashar al-Assad, the electric energy of the Arab Spring, the Assad regime’s use of chemical weapons, and the rise and appeal of ISIS. The Topography of Terror, a documentation center at the former site of the headquarters of the Gestapo and the SS. At times during our walk, I felt like the others in the group had shown up in order to meet a Syrian for the first time. The next day, I met Mohamad to find out if he felt the same way. He said that he knew that many people came just to meet a Syrian in real life, and he had no problem with that. He wanted them to. He had discussed the contents of the tour with Cannon and his Syrian friends and had made peace with his delivery, though he was still trying to perfect it. The one thing that irked him was when people exclaimed that he spoke English well. “Am I not supposed to?” he said with a laugh.